THE DEAD DAISIES’ awesome live juggernaut is set to storm into North America in August for a dozen prime live dates as part of their Live & Louder World Tour, in support of the release of their Live And Louder album on Spitfire Music/SPV/eOne on May 19th. 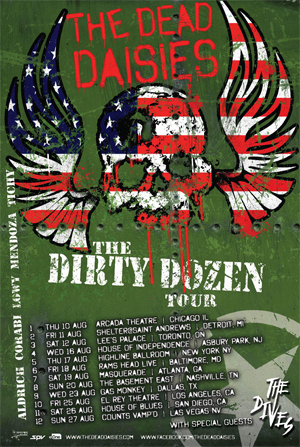 Heralded “The Dirty Dozen Tour”, the trek is set to kick off in Chicago, IL on August 10th and will wrap in Las Vegas, NV on August 27th. It will be the band’s first North American Headline Tour where demand has been steadily building after 2016’s success of their third album Make Some Noise. Before being turned loose on North American audiences, the troops will be fresh from playing some of the most prestigious & high profile UK & EU Rock Festivals coupled with a series of headline club shows, dates in Japan to then make their long-awaited debut in South America. From South America it’s back to one of the EU’s largest Festivals Woodstock Poland, to be part of a “Concert Inspired by Freedom” which will see the band perform with a 60-piece Orchestra. The “Live & Louder” - World Tour 2017 will visit the following countries: Germany, Austria, Switzerland, Denmark, Sweden, United Kingdom, Holland, France, Belgium, Hungary, Czech Republic, Japan, Brazil, Argentina, Chile, Mexico, Poland, Canada and the USA. Live & Louder will be available in multiple deluxe formats & perfectly captures the awesome vibe of their supreme, sweat drenched, roof-raising live sets, recorded on a heady high at the end of an unbelievable 2016. The result, once again mixed by Anthony Focx (AEROSMITH, BAD COMPANY), is an absolute stunner! Special Guests on this run will be THE DIVES which the band made instant friends with on the previous years’ KISS Kruise and who will add their own blend of signature rock and roll to the fiery package. Rock & Roll is indeed alive and well!!! More South American Dates to be announced!